Young Chef Olympiad started with a vision of being the best platform to bring the world closer, via food as food unites people. Thus, Dr. Suborno Bose, Chairman,YCO Global Council Co-chairman and CEO, International Hospitality Council Founder and Chief Mentor, Indismart Group YCO, took the initiative and kicked off Young Chef Olympiad in the year 2015 and rest is history! The International Young Chef Olympiad 2015 was held in the city of Kolkata, India. The Ministry of Tourism (India), Government of India supported the world’s first such event. The event was declared open at the City Centre (Salt Lake City, Kolkata) on the 29th of January 2015. All the participating countries namely United States, UK, Spain, France, Switzerland, China, Malaysia, Thailand, Myanmar, Kenya, Zimbabwe, Sri Lanka, Bangladesh, Bhutan and India, marched in to the arena with their country flags, supported by their teams and to unceasing applause from the crowd. India was represented by Ms. Dhriti Verma, 3rd year student of IIHM Jaipur. Chief Guest for the evening, Mr. Scott Furssedonn Wood, the British Deputy High Commissioner in Kolkata, wished luck to the participants. Dr. Suborno Bose, founder of Young Chef Olympiad concept and chairman of the organizing committee of the event and Chief Mentor of International Institute of Hotel Management unveiled the YCO trophy and declared the Olympiad open. The Young Chef Olympiad flag was carried to the opening ceremony by 4 women. Ms Madhumita Mohanta, Executive Chef of the Lalit Great Eastern – Kolkata, Siddhika Ghosh – Owner of Restaurant “The Wise Owl” in Kolkata, Chef Payal – Master Chef Finalist from Kolkata and Chef Priti Singh, Faculty- IIHM Kolkata. The YCO oath was taken by Dhriti of India on behalf of all the participants. The Olympiad torch was carried to the arena by Garima Poddar, winner of the Young Chef India Schools 2014 contest held in London, and along with all the contestants lit up the main torch positioned on the top of the cake under the supervision of the Culinary Director of IIHM Chef Sanjay Kak. The lighting of the flames was followed by the cake cutting ceremony. The 15 participants were Dylan from USA, Leo from France, Marcin from Spain, Marlon from China, Sumaiya from Bangladesh, Ian from Kenya, Indra from Bhutan, Tadiwa from Zimbabwe, Harsha from Sri Lanka, Ryan from Switzerland, Jennipha from Thailand, Tajinder from UK, Htoo from Myanmar, Ashwin from Malaysia and Dhriti from India. They had to compete against each other for the top 8 positions on 30 January in the preliminary and elimination round. They had to cook with the given ingredients, within a specified time. They were marked on creativity, hygiene, taste and optimum utilization of the ingredients. The team of judges was headed by Prof. David Foskett – Head, London School of Hospitality and Tourism, University of West London, UK along with Chef Kunal Kapur of the Master Chef India fame, noted food critic and writer – Chef Karen Anand, Italian Master Chef Roberto Boggio, and Chef Shaun Kenworthy. The final was a contest between Spain, Malaysia, Switzerland, Thailand, UK, Kenya, France and India. In the competitive finals the contestants were asked to cook vegetarian dishes which was challenging for contestants from France and Spain as they were not trained to cook such dishes. The winner was Ashwin from Malaysia, followed by 1st runner up Marcin from Spain and 2nd runner up Tajinder from UK. Judges introduced an award for the Outstanding Dish as well and was given to Ian from Kenya. Ashwin, the 2015 Young Chef Olympiad winner, was awarded a cash prize of $10,000 USD, the YCO trophy and a gold medal. 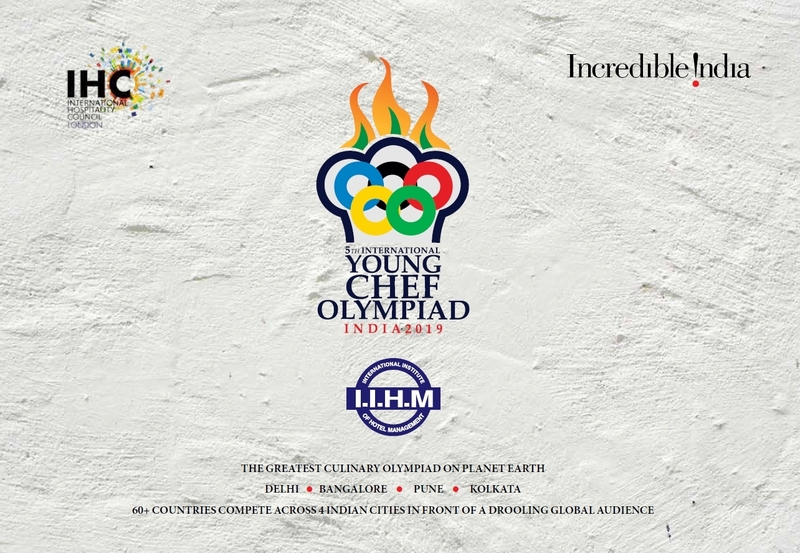 The 2nd International Young Chef Olympiad 2016, supported by Ministry of Tourism (India), Government of India, organized by International Institute of Hotel Management was held across 4 cites, Delhi, Mumbai, Bangalore and Kolkata and saw a participation from over 50 countries around the world. YCO 16 Opening Ceremony at the Talkatora Stadium, Delhi. The opening ceremony was held at the Talkatora Stadium, Delhi on 27 January 2016. Students from various Delhi schools performed at the opening ceremony of YCO 2016. The countries were divided into 3 groups for the round 1 of the competition. Round 1 at Delhi was held on 28 January 2016 at the IIHM, Delhi Campus and Group 2 and 3 flew to Mumbai and Bangalore for their Round 1 which was held on 29 January 2016. Round 1 at Mumbai was held at the Mumbai Cricket Association, Bandra Kurla Complex and Bangalore Round 1 was held at the Royal Orchid Hotel. Round 2 & the Grand Finale was held at the IIHM, Salt Lake campus, Kolkata. There was a distinguished panel of Judges to judge the competition headed by Dr. David Foskett, who has been the dean and head of the London School of Hospitality and Tourism at the University of West London, and is the chairman of the YCO jury. The jury also had Chef Sanjeev Kapoor who is the principal judge and YCO mentor. Other panel members were Chef Kunal Kapur, Chef Andreas Muller, Chef Udo Leick, Chef Manjit Singh Gill, Chef Karen Anand, Chef Abhijit Saha and Chef Shaun Kenworthy. After Round 2, 11 countries were selected for the final. They were UAE, Finland, Switzerland, France, Mexico, Kenya, Canada, Mauritius, Romania, USA & Hong Kong. Dr. Suborno Bose & the panel of judges presenting the winner trophy to the YCO 16 winner Daniella Garmond. The Award & Closing Ceremony was held at the Wet-O-Wild ground of Nicco Park. Usha Uthup was the star performer of the night. The joint second runner-up was Johan Kurkela from Finland & Fernando Andres Guajardo Moguel from Mexico. The first runner-up was Gabriela Aleksandrova Hristova from UAE. The winner of the 2nd International Young Chef Olympiad 2016 was Daniella Garmond from Canadian Food & Wine Institute, Ontario, Canada. The trophy and cash prize of USD 10,000 was presented by Dr. Suborno Bose. The panel of Judges and Chef Ranveer Brar was present while the award was given. Commenting on the event, Dr. Suborno Bose, Chairman of the Young Chef Olympiad and CEO-IIHM, said, “We are delighted at the global participation this year. It is a fantastic event that will reach out globally to as many countries as possible. Food has always been the biggest unifier and continues to be so in today’s day and age. YCO has connected talent across borders from the best culinary colleges under one roof making it a truly global event. Connecting the students from India with world class chefs from across the globe will not only bridge bonds but will also lay foundation of a global connect that will go a long way in each of their careers. The YCO will not only produce and refine the best talent amongst the young chefs but will also give the young talent a platform to learn, teach, showcase and network with. The 3rd International Young Chef Olympiad 2017, supported by Ministry of Tourism (India), Government of India, organized by International Institute of Hotel Management was held across 4 cites, Delhi, Pune, Bangalore and Kolkata and saw a participation from over 45 countries around the world. The opening ceremony was held at the Talkatora Stadium, Delhi on 28 January 2017. Students from various Delhi schools performed at the opening ceremony of YCO 2017. The young chefs were divided into 3 groups and they battled it out in 3 rounds across 4 cities of Delhi, Bangalore, Pune & Kolkata. The ten finalist countries, after completing 3 rounds, were Australia, Canada, England, India, Malaysia, Mexico, Myanmar, Philippines, Singapore and Sri Lanka. Tham Jiajun Mathew from Sunrice Global Chef Academy, Singapore was the winner of Young Chef Olympiad 2017. Padma Shri Sanjeev Kapoor with Prof. David Foskett and Dr. Suborno Bose presented the Trophy and a cash prize of $10,000 to Tham Jiajun Mathew at the closing ceremony in Kolkata on 2nd February 2017. 1st runner up was Andrew Ou Kai Peng from Malaysia and 2nd runner up was Selah Schmoll from Canada. Luigi Amaduzzi from Alma La Scuola Internazionale Di Cucina Italiana, Italy was awarded the Dr. Zenobia Nadirshaw Award for the ‘Most Inspiring Young Chef’. Puja Mishra of IIHM, India won the Late Shrimati Shakuntala Devi Award for the Best Vegetarian Dish which also carried a cash prize of $500. Jack Gameson from University College Birmingham, England won the Morde Best Dessert Award. Tham Jiajun Mathew also won the award for Best Hygiene Practice. The celebrity mascot of YCO 17 was Masterchef Junior 2014, USA winner Logan Guleff. Padma Shri Sanjeev Kapoor, Chef Boris Leung Yee Chung, Chef Ranveer Brar, Chef Michele Prevedello, Chef Andreas Muller, Chef Karen Anand, Chef Avijit Ghosh, Chef Abhijit Saha and Prof. David Foskett were some of the notable judges of the Young Chef Olympaid 2017. 17 participating International Culinary Institutes from 17 countries signed MOU with IIHM, India for exchange of ideas, students and faculty. The 4th International Young Chef Olympiad 2018, supported by Ministry of Tourism (India), Government of India, organized by International Institute of Hotel Management was launched on 9 November, 2017 at The Hilton Double Tree Hotel in London. The launch ceremony was attended by the judges of The 4th International Young Chef Olympiad 2017. They are Chef Chris Galvin, Chef John Wood and Chef Enzo Oliveri. The adjudicators Zenobia Nadirshaw and Ron Scott along with Prof David Foskett, the chairman of the jury was also present, Dr Suborno Bose, the chairman of the Young Chef Olympiad 2018 Committee said, “The Young Chef Olympiad was conceptualised as a platform for young chefs-in- training from around the world to interact and showcase their talent. We are glad to see a great response from the international community, who have come together to make this event a great success over the past three editions. We have put India at the centre of the culinary map of the world. In future, we intend to make Young Chef Olympiad bigger with over 100 countries participating in our next edition.“ Participating countries was divided into number of groups in the launch ceremony. Th United World of Young Chef was held on 31st January 2018 evening at the Hyatt Regency, Kolkata as a fun event where all the participating countries cooked their national disk. The final top 10 countries were Bangladesh, Mauritius, Bhutan, Hongkong, Ireland, Malayasia, Iceland, New Zealand, South Korea and India.